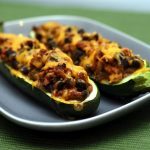 Using great ingredients you can create a truly fun way to have stuffed zucchini Mexican Style! •	Fresh coriander and lime wedges for serving. If you have hot sauce you may want to add that too. •	Preheat oven to 220 C.
•	Slice each zucchini in half lengthwise, and scoop out the inside. Keep the insides and add it in with the black beans. •	In a large skillet over medium-high heat melt the oil and add onion, and cook until the onion becomes translucent, then add in the garlic and cook for 30 sec before adding in the spices - chili powder, ground cumin, and cinnamon). Cook until fragrant, about 1 minute, stirring often. •	Next stir in the black beans, corn, zucchini from the inside and jalapeños and cook until they're beginning to brown, 3-5 minutes, continuing to stir often. Add the tomatoes and broth to the pan and cook until the liquid has absorbed, about 2 minutes more. Stir in 1/2 cup of cheese and season to taste with salt and pepper. 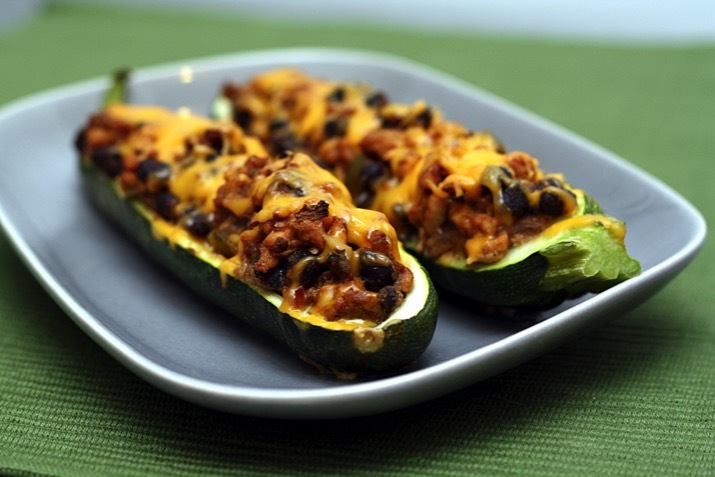 •	Fill each zucchini half with the black bean mixture and top with the remaining cheese. Transfer zucchini to a baking dish or sheet and bake for 10-15 minutes, or until the tops are browned. Serve with chopped coriander and lime wedges. Blood Sugar Benefits - Metabolism of sugar in the body requires ample presence of many B-complex vitamins, and most of these B-complex vitamins are found in valuable amounts in summer squash. Included are the B-vitamins folate, B6, B1, B2, B3, and choline. Anti-Inflammatory Benefits - The presence of omega-3 fats in the seeds of summer squash, the presence of anti-inflammatory carotenoids like lutein, zeaxanthin and beta-carotene, and the presence of anti-inflammatory polysaccharides like homogalacturonan make this vegetable a natural choice for protection against unwanted inflammation.